2016 IACP Cookbook Award winner in Children, Youth & Family category "An intuitive cook, a passionate cook, a knowledgeable cook...JeanMarie and I have been in cooking sync for more than two decades." -Rick Bayless JeanMarie Brownson has long been a beloved chef and food writer, from her professional partnership with the iconic Rick Bayless (Frontera Grill, Topolobampo, Xoco) to her time as the test kitchen director and associate food editor for the Chicago Tribune. 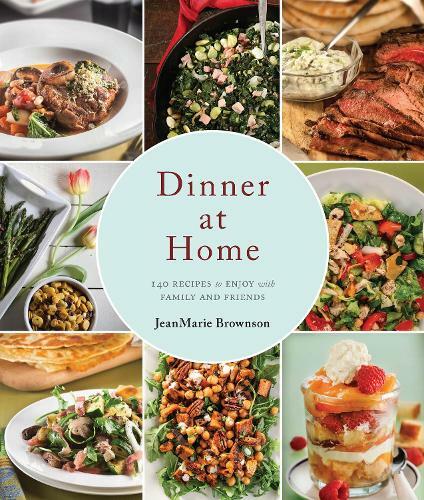 Since 2007, Brownson has chronicled her life of cooking in a series of columns, the best of which have been hand-picked to form her newest cookbook, Dinner at Home. This book features inventive and easy-to-make recipe ideas, along with gorgeous full-color photography. Organized by course, Dinner at Home also devotes chapters to holiday dinners, party snacks, rubs and sauces, and "breakfast for dinner." Readers will enjoy the seasonal menus for special occasions such as Anniversary Dinner, Ultimate Father's Day, and Sunday Brunch, as well as themed meals like Manhattan Cocktail Party, Saturday Night Beer Tasting, and Wish We Were in Ireland Supper. This book is a must-have for home cooks who love the time spent gathered around the table with friends, family, and delicious meals.